First reconstruction of Neanderthal man. Image: Ther Neanderthaler Fund. Publisher: Marcus, Bonn. Via Wikipedia. (PhysOrg.com) -- New research into Neanderthal skulls suggests that facial features believed for over a century to be adaptations to extreme cold are unlikely to have evolved in response to glacial periods after all. A team led by Dr Todd C. Rae from the Centre for Research in Evolutionary Anthropology at Roehampton University in the UK took previously published measurements of X-Rays and new data from three-dimensional (3D) computer tomography (CT) scans of nine Neanderthal skulls, all dated at over 28,000 years old. They then collected measurements from four Homo sapiens skulls from archaeological sites in Lithuania and dated from 300 to 1,500 years old. They compared the two sets of measurements to determine how large the sinuses of Neanderthals actually were. They used medieval Homo sapiens skulls rather than present-day skulls because they wanted data from a period before air conditioning and central heating, which could have affected the results. The results showed the Neanderthals did have larger sinuses than Homo sapiens, but the relationship between the size of the face and the size of the sinuses was the same in both species. This suggests the facial features were not related to adaptation to cold. Dr Rae said the results mean the idea of the faces being an adaptation to cold could now be dismissed, which he said allows us to think about Neanderthals and their lives in new ways. He said there had long been a view of Neanderthals as living on frozen tundra in the last glaciation, but it was more likely that they lived in temperate refuges, eating fruit and berries as well as meat. Dr Rae said attributing many of their physical traits to adaptations to extreme cold do not make any sense and a picture of them as a temperate creature fits the data better. He speculated that if Neanderthals were confined to warmer regions their populations could have been too isolated and small to survive the worst of the glacial times. Neanderthal fossils are found throughout Europe and parts of Asia. Recent research has found they used sophisticated tools, cooked their food, which included grains, vegetables and berries, and they may also have been able to speak. The paper is published in the Journal of Human Evolution. When they made the facial sinus comparison did they use Caucasian Europeans who themselves may be cold adapted? I suggest they make the comparison using Negroes too, who come from tropical Africa and probably are not cold adapted. Also European may have Neanderthal or other cold climate archaic genes in them where as Negroids may not. It says in the article that the sample skulls were from Lithuania, dated from 300 - 1500 years old. I really doubt most Europeans would have cold-adpated sinuses, though, given the contrast of the present climate from the last glacial period. Paleoanthropologists already have determined that the direction of evolution was from large faces (implying large sinuses) in archaic populations to small faces (implying small sinuses) in modern populations. 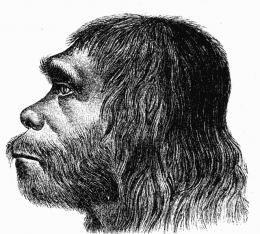 All earlier hominins have relatively large faces compared to modern humans.